PARIS (Reuters) - France's President Emmanuel Macron took on critics of Saudi Arabia's Crown Prince Mohammed bin Salman on Tuesday, saying it was too easy to criticize the young leader's haste to reform and urged detractors to give him time. But the severity and secrecy of an anti-corruption crackdown last November, after the prince ousted an older cousin as crown prince in a palace coup last June, has unnerved some investors. Human rights groups also question how far the kingdom has come. After a tense first exchange between the two leaders in Riyadh last November that was dominated by a difference of opinion on how to handle Riyadh's regional rival Iran, Macron and Prince Mohammed sought to get to know each other and work on what they have in common rather than their differences. "I hear legitimate questions from civil society, journalists about human rights and various sensitive issues concerning your country, (but) I'm also looking at what's going on in the region. We have here a young leader who is going to be in the highest functions in a country where 70 percent of the population is under 30," Macron said alongside the 32-year-old prince. "We can have the choice to stick to our traditional positions and we can decide that the first acts of modernization of his society are cosmetic. If we do that then we are leaving Prince Mohammed to face those in his area that think the opposite and decide to go backwards and keep to a political Islam or terrorism," he said. Under the reforms closely associated with the crown prince, social restrictions have been loosened, such as bans on cinemas and women driving. He has promised to promote a more moderate form of Islam. During his visit to Paris, he met interfaith leaders and pushed for a new strategic partnership that in essence focused heavily on France's cultural soft power and tourism know-how rather than signing billions of dollars worth of lucrative contracts as he had done in the United States and Britain. 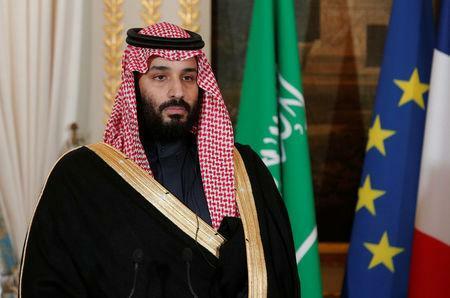 "You and I are old in Saudi Arabia because 70 percent of the population is younger than us," Prince Mohammed joked during the news conference at the Elysee palace. Macron is only eight years older than the prince. 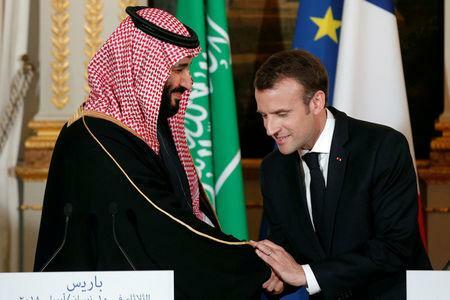 "The partnership between Saudi Arabia and France is very important, especially now that Europe and the Middle East are going through changes in the world." The two leaders also had some tense moments in November after Lebanese officials accused Saudi Arabia of holding Prime Minister Saad Hariri hostage in the kingdom. 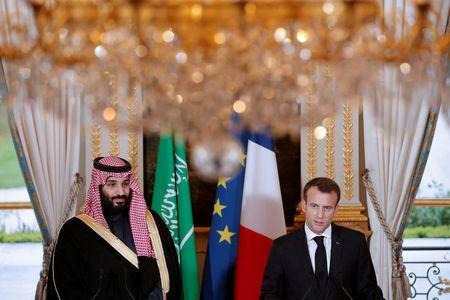 Macron eventually mediated a solution with Prince Mohammed to the problem, and on Tuesday the three dined at the Elysee palace with Hariri tweeting a selfie of the three of them. While Macron made no specific references to human rights or freedoms in the kingdom, he had perhaps opted to push a more subtle message two days earlier in a private dinner and tour of the Louvre museum, including an exhibition of revolutionary 19th-century French painter Eugene Delacroix. A picture on Macron's Twitter feed showed the two men contemplating Delacroix' most famous painting, Liberty Leading The People, a bare-breasted woman standing over revolutionary barricades holding a French tricolore flag.